I've been working for HM Land Registry for four years this month. My work anniversary makes me reflect on my role, and some tips that I have learned that could help homeowners. When I joined HM Land Registry I had no knowledge of land registration and a million questions to ask and in this blog I want to answer two of the big ones. HM Land Registry cannot resolve boundary issues for you. If you have a problem with a boundary, the simplest and most effective way to deal with it is to talk to your neighbour and try to reach an agreement before it becomes a legal dispute. We hear lots of myths about which boundary you are responsible for, such as "You always own the left (or right) side" or "If the fence is on your side, you own it" but every property, every boundary and every neighbour is different. Your title deeds may have information or covenants about boundaries, but often they don't and the information may become out of date if neighbours decide to agree to a different arrangement. The title plan you can buy for £3 from our Find a property service will only show you the general position of the boundaries, because the legal boundary is an invisible line. if you get married and change your name, use form AP1. Recently, we've been exploring how we might help our customers find answers to frequent questions, while reducing the number of times they need to contact us. Our forms and processes are not always the easiest to complete or follow, because land and property ownership is a complex topic, and after four years I'm still learning! I've been involved in some recent research and workshops involving a wide range of people from our enquiry handling teams, operational areas and callers and will be helping to move this piece of work forward. We are trying to improve things for customers, so watch this space! Another frequently asked question is about the age of properties. We don't actually record the age of a building (it is never polite to ask a lady her age don’t you know), if you want to find out more we wrote a blog about it “How old is my house?”. Want an easy way to reduce the time and cost of your conveyancing? You may come across to my situation many times but please guide me. My neighbour erected a new fence which is not straight thus encroaching to my land. He also erected a room at the end of his garden (which does not require planning permission) taking the full width of his garden. This new room is next to our garage which is also at the back of our garden. Our garage is not erected to the boundary line. The new fences he erected are encroaching to my land especially next to my garage. This was done deliberately so a way is left for him to come though the alleyway at the back of our houses to his garden. I cannot do any works even at my garage as he erected the fences in such a way by taking all my free space from my garage to his new room he erected. I have tried all ways and he is not willing to move to the original boundary as he has removed the old posts. I did not take pictures to prove this. Even with a naked eye however one can see clearly that the fences are encroached in my land. He erected the last 7 posts in a gradual way. Dear Adam, we are in a row of 5 houses with a path at the back of our houses. 3 of these houses own a section each of this path. A neighbour (who does not own any of the path) is applying for planning permission to build a house on the other side of this path, the back wall of which butts right up against this path. In building this wall footings are going to be needed which we think will mean damage to our path. Has the neighbour the right to do this without our permission. Should we be alerting someone in the Planning Department? Hi. We have a field and are responsible for the boundary fence. The woman who has the field next to us has horses and is complaining that the horses are coming through the fence and into our field. The fence is not in a massive state of disrepair, but as it's our boundary fence can she force us legally to replace the fence if we don't want to. 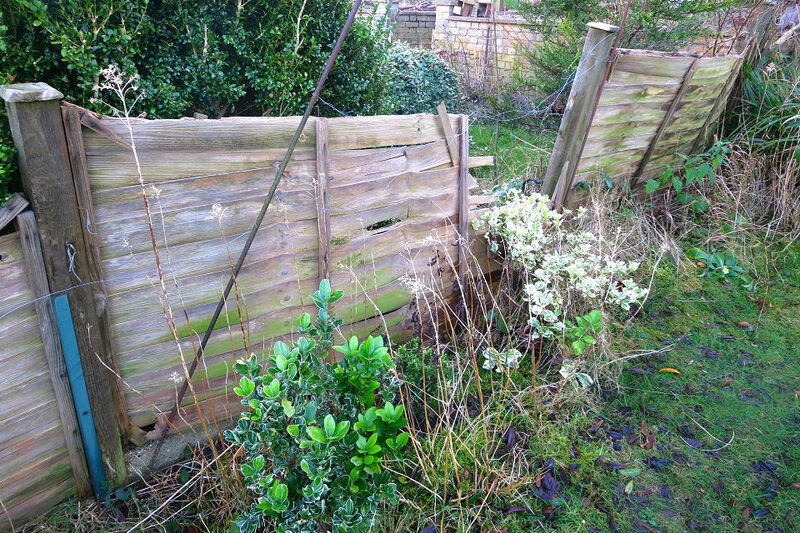 Given she has no legal right to refence why would you be so unneighbourly as not to repair your own fence? She would have a cause of action against you for negligence were anything to happen to her horses as a result of the fence not being repaired. when we purchased the property two deeds for our property were presented. Both have our name on as being the owners, but the boundary line differs on each one. Does the deed with the most recent date supersede the first? If so, why would we be given two in the first place? Sue - sorry to raise what is probably an obvious point, but is the property registered under two separate title numbers? This is fairly common, for example, where the house is registered under one title and a garage another. If so, both will be current. If they relate to the same title number, then the edition date on the register should indicate the latest copy of the title record that you hold. Similar with the title plan - sometimes an updated edition of the title plan is prepared in which case the latest date will indicate the most up to date copy that you hold. aaah thank you, that makes sense. They have 2 different title numbers. One must be for an old annex I think, which is now integral to the main house.